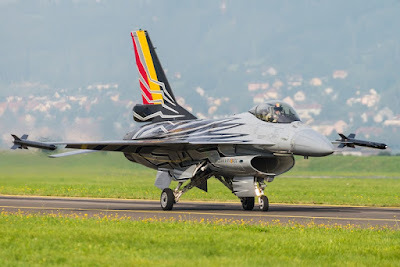 Home / Airshow / Belgian Air Force / F-16 / Reports / THREE YEARS GIZMO! After three years of amazing performances all over Europe, the demo pilot CDT VL "Gizmo" De Moortel has completed his task in the Belgian F-16 Solo Display Team. "Gizmo" F-16 Demo Pilot aboard his "Blizzard"
Commandant Tom “Gizmo” De Moortel started his career at the Belgian Air Force in 1996. 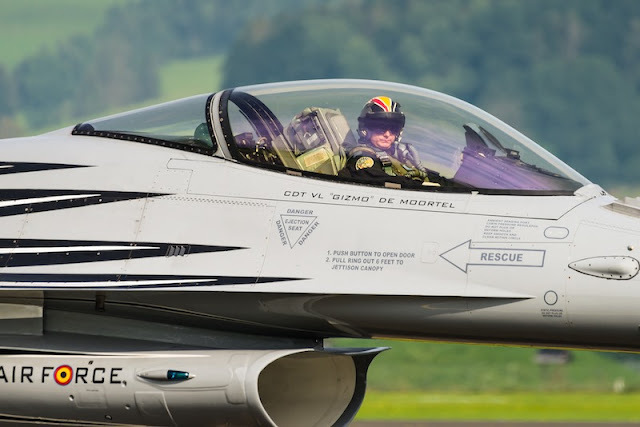 After he obtained his wings in 1998 he flew different types of military aircraft. 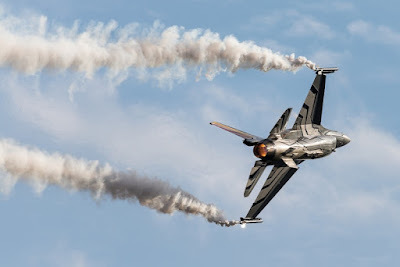 Gizmo learned to fly a jet on the Alpha-Jet with the help of the former Belgian display pilot Patrick De Schrijver (display pilot on the Alpha-Jet from 1994 till 1999) after which he started flying with the F-16 fighter jet. Besides flying with jets, Gizmo has also flown with the C-130 Hercules transport aircraft and the Marchetti SF-260M/D training aircraft. Eventually In 2006 Gizmo joined the 31 Squadron at the Kleine Brogel Air Base and became the Wing Aviation Safety Officer (WASO) in 2013. 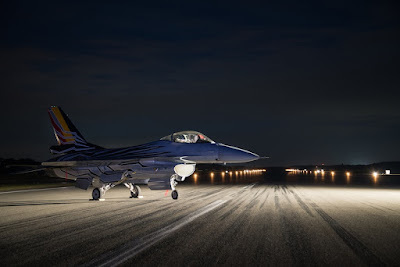 During his career as a pilot he logged over 4,700 hours of flying, with more than 1,800 hours on the F-16 fighter jet. In 2017 Gizmo moved to the Operational Conversion Unit (OCU), training the next generation of Belgian fighter pilots. 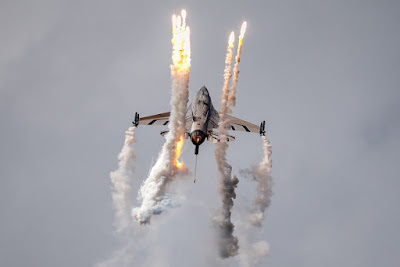 In 2015 Gizmo was selected by the Belgian Air Force to become the official F-16 solo display pilot for the next three years. 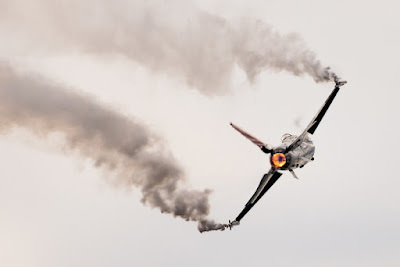 For the displays Gizmo received a dedicated jet (FA-123), nicknamed "Blizzard". The impressive black, grey and white paint was designed and created by Johan Wolfs and executed by 10Wtac paintshop in collaboration with car-service. 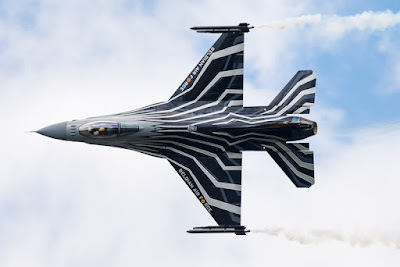 With this design they wanted to emphasize the smoke winders and vortices that come off the fighter jet. 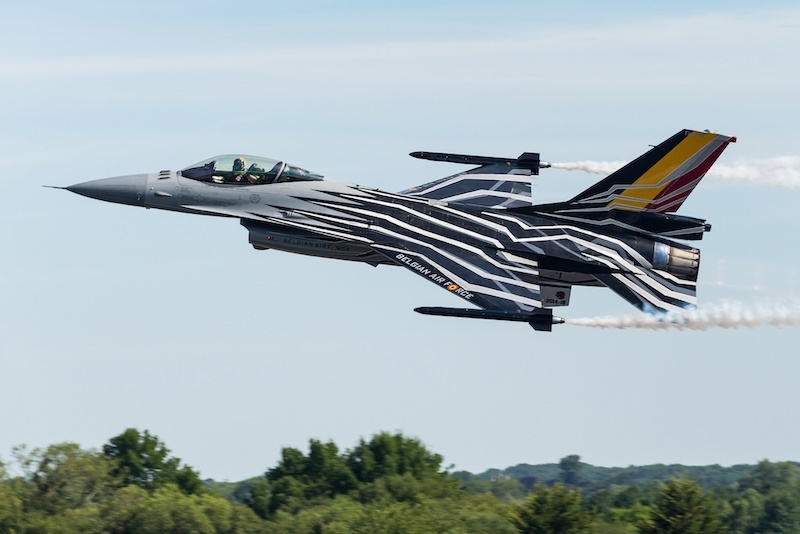 Next to a beautiful painted Viper, Gizmo could count on a team of specialists who assisted him during each show. This team consisted of a crew chiefs, weapons specialists for the smoke winders, coaches and a team manager. The coaches fly the spare display aircraft to the shows and monitor and supervise his performance. 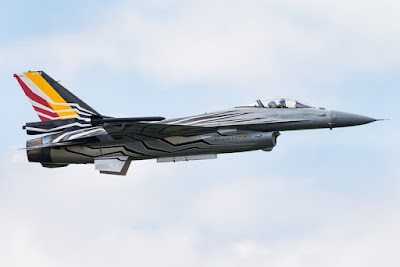 With his performance, Gizmo tried to give the audience an overview of the F-16's manoeuvrability and the skills of all F-16 pilots of the Belgian Air Force. During the three busy years of F-16 solo display pilot Gizmo became one of the most important ambassadors of the Belgian Air Force at airshows and other aviation events abroad. His performances were to be seen in Belgium, The Netherlands, France, United Kingdom, Spain, Austria, Norway, Italy, Sweden, Slovakia, Malta, Czech Republic, Switserland, Greece, Poland, Denmark and Portugal. The published pictures of Gizmo and his "Blizzard" were taken at the Sanicole International Airshow 2016 and 2017, Zeltweg Air Power 2016, Belgian Air Force Days 2016 and the Kleine Brogel Air Base spottersday 2017.